Coronary computed tomography (CT) is well established for the assessment of symptomatic patients with suspected but not yet confirmed coronary artery disease with high diagnostic accuracy and risk prediction. Until recently, coronary computed tomography angiography (CTA) has played a limited role in the management of complex coronary artery disease (CAD) and in planning revascularisation strategies. 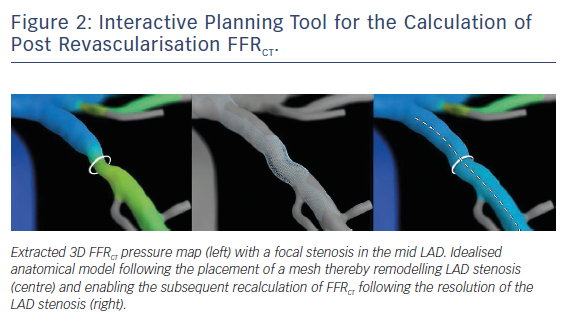 With the advent of FFRCT, enabling anatomy and physiology with a single study and the ability to adjudicate lesion specific pressure loss, the potential of combined coronary CT angiography (CCTA) and fractional flow reserve (FFR) computed from non-invasive CT angiography (FFRCT) to inform treatment decision-making and help guide revascularisation has been recognised. In this review, we highlight the evolving role of FFRCT in the management of complex CAD; the opportunities, the data and the unanswered questions. Jonathon Leipsic receives fellowship support from GE and serves as a consultant to and holds stock options in Circle CVI and Heartflow. This work has been supported by the Arnold and Anita Silber and Syd and Joanne Belzberg Family Foundations. Much of the early clinical trial work and clinical focus has been placed on the avoidance of invasive angiography in patients with anatomical stenoses on CTA. While a meaningful opportunity to help overcome a limitation of clinical CT adoption, it is not the only role for FFRCT in stable chest pain. This is particularly the case as CCTA is being used in patients with higher pre-test likelihood, more coronary calcification and more complicated coronary artery disease (CAD).10 In these patients, FFRCT has been shown to be effective in characterising lesion specific ischaemia despite the higher burden of coronary artery calcium (CACS). Norgaard and colleagues,11 in a sub-analysis of the NXT trial evaluated the diagnostic performance of FFRCT in the setting of higher CACS and noted that while the diagnostic accuracy of FFRCT was slightly lower at CACS >400 it was not significantly so, unlike CCTA alone, the accuracy of which was significantly worsened. Beyond diagnosis and risk stratification, the role of non-invasive imaging has always been to help enrich the population referred to the catheterisation laboratory. It has become increasingly clear that traditional stress testing is not effective in discrimination of those who are likely to be found to have actionable coronary artery disease. Given the apparent disconnect between stress testing and findings at the time of invasive coronary angiography (ICA) and the lack of anatomical information provided by stress testing, there has been little integration of non-invasive imaging in the guidance of revascularisation decision-making at the time of ICA. With the maturation of CCTA and the integration of FFRCT there is the opportunity to not only rule out disease with CCTA but to help guide and plan ICA and revascularisation strategies on the basis of anatomical stenosis and lesion specific ischaemia. Jensen and colleagues recently confirmed a significant increase in the percutaneous coronary intervention (PCI)/ICA ratio particularly in the higher risk population, importantly with PCI adjudicated by invasive physiology as well.12 In addition, ICA was cancelled more frequently in the high risk population on the basis of FFRCT (75 %) versus CTA alone (45 %). These data introduce the possibility of PCI decision-making without needing to adjudicate ischaemia invasively owing to the high concordance between non-invasive and invasive measures of ischaemia. Given the growing evidence of the relatively high frequency of and the increased hazard associated with incomplete revascularisation, the need to develop a more thoughtful approach to revascularisation seems necessary. With this growing and clear need, investigators have begun to explore ways of using non-invasive imaging data to help inform interventional strategies. Collet and colleagues also recently evaluated the potential that a non-invasive approach to adjudication of anatomy and physiology could act as a surrogate in treatment decision-making for invasive evaluation in the SYNTAX II trial (SYNTAX II). Interestingly, the authors found that there was poor correlation between the invasive and non-invasive anatomical syntax but much better correlation between the non-invasive and invasive functional syntax score.13 The anatomical SYNTAX score was overestimated by CTA compared with conventional angiography (27.6 ± 6.4 versus 25.3 ± 6.9; p<0.0001) whereas the calculation of the functional SYNTAX score yielded similar results between the non-invasive and invasive imaging modalities (21.6 ± 7.8 versus 21.2 ± 8.8; p=0.589) (Figure 1). 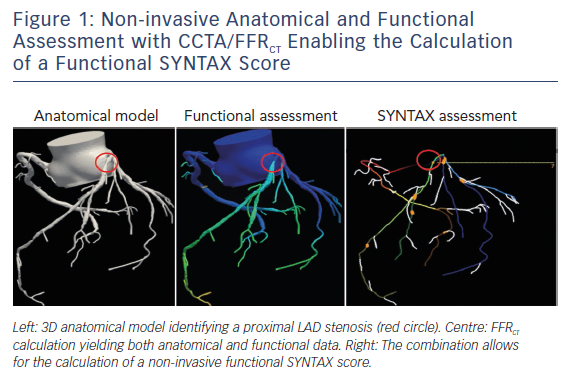 In fact, in patients with three-vessel disease the CTA SYNTAX score almost uniformly overestimates the anatomical SYNTAX score derived from coronary angiography whereas the non-invasive functional SYNTAX score (FSS) was both feasible and yielded similar FSS compared to the invasive FSS and allowed similar reclassification rates. Being able to provide a non-invasive FSS offers significant potential to reduce resource utilisation at the time of ICA through reducing the need for invasive adjudication of ischaemia and by enabling the development of a revascularisation strategy in advance of ICA. In addition, by providing a non-biased three-vessel anatomical and physiological mode, the historical anatomical bias that determined whether ischaemia should be adjudicated no longer exist. Given the growing evidence that incomplete ischaemic revascularisation results in worsened event-free survival, tools that allow for effective decision-making that results in a higher likelihood of full ischaemic revascularisation should be considered. This premise has been tested in the SYNTAX III trial which just recently completed enrolling. In this trial, subjects were randomised to non-invasive and invasive physiological adjudication of ischaemia. The results were reported at EuroPCR 2018 with the findings highlighting strong good agreement of treatment decision-making between CTA/ FFRCT and ICA/FFR strategy (Cohen’s kappa=0.82; CI: 0.73–0.91). The heart teams agreed on the coronary segments to be revascularised in 81.1 % of the cases. As well, FFRCT changed the treatment decision in 7 % (14/196) of the patients with 13 patients having a recommendation of surgical revascularisation changed to a percutaneous approach. Importantly, in both of these studies, CTA/FFRCT did not define the treatment but did provide important proof of concept and data to enable the initiation of the SYNTAX IV trial where patients will be randomly assigned to treatment decision-making by CTA/FFRCT versus the traditional approach of ICA/FFR. This trial represents the next step towards meaningfully embedding non-invasive imaging in interventional and revascularisation planning. Over the last 15 years, we have seen a reinvigoration of the Heart team in the context of transcatheter aortic valve replacement (TAVR). This Heart team strategy has been pivotal in helping TAVR with its rapid evolution and clinical adoption. This collaborative pre-procedural discussion has allowed more informed and collaborative decision-making. These discussions have also allowed for deeper integration of non-invasive imaging in the structural space by allowing the imager to better understand the clinical needs and the interventionalists to better understand how non-invasive imaging can help inform decision-making and improve clinical outcomes. Unfortunately, the evolution of percutaneous coronary intervention has largely happened in isolation at least in part owing to the historical lack of meaningful non-invasive imaging to support decision-making. While invasive angiography is the gold standard for anatomy, with the improvements in coronary CTA and now advanced computational analytics offering non-invasive FFR, delta FFRCT, plaque and coronary geometry, it is time to revisit the coronary heart team for coronary artery disease. Perhaps the days of going to the catheterisation laboratory on the basis of symptoms and a nuclear stress test without any knowledge as to the extent, severity, or pattern of CAD are numbered. It would be hard to imagine going to the hybrid surgical suite and performing a TAVR without any baseline imaging or sizing of the annulus nor an assessment of anatomical drivers of procedural complications in the same way surgeons would not go to the operating room without imaging to provide an initial plan. Clearly, the incremental value of CTA FFRCT will need to be proven in a prospective randomised fashion but the opportunity is finally a reality. Recently, the concept of an interventional planner has been introduced where an idealised model is created to simulate the post PCI coronary artery allowing the calculation of a post-PCI FFRCT (Figure 2).14 This pre-procedural calculation of post procedural physiology offers another opportunity to help further guide the interventionalist with revascularisation decision-making. In the original feasibility accuracy study, virtual post FFRCT displayed fairly robust diagnostic performance for the prediction of post-PCI physiology. This initial version was limited in scope and clinical utility owing to the computational requirements which could not be met to allow timely enough modelling to be used for clinical care. With further improvements in computational capacity these idealised models can now be performed by physicians at their site, thereby opening up the opportunity to help inform revascularisation decision-making. Clearly this interactive planner will need further diagnostic performance validation and then ultimately, if proven to be robust, to determine its clinical utility and impact on clinical decision-making and downstream clinical outcomes. There remain challenges with the integration of FFRCT into the clinical paradigm. The technological hurdles regarding computational processing have been significantly reducted in the turnaround time from 24 hours at the time of initial release to <5 hours in the large majority of cases at present. Lack of reimbursement in some healthcare environments has also posed meaningful challenges towards broad adoption. These economic and funding issues will need to continue to be managed globally to see meaningful pervasion into clinical practice. Finally, non-invasive diagnosis of coronary artery disease has long been dependent on ischaemia testing, this established practice pattern has supported the field for decades and shifting practice is not a minor task. It is possible that the demand from an interventional perspective for a roadmap prior to invasive evaluation may impact initial test selection amongst symptomatic patients with suspected CAD. To tackle a disease as complex as CAD, having more information prior to the intervention may help with thoughtful and controlled decision-making. Recently, there has been increasing evidence of the incidence and associated risk of incomplete ischaemic revascularisation. Choi and colleagues found that approximately 25 % of patients undergoing multivessel disease revascularisation do not experience complete ischaemic revascularisation. Importantly, these subjects had a significantly higher MACE rate in multivariate analysis (adjusted hazard ratio: 4.17; 95 % confidence interval: 1.85–9.44; p<0.001).15 Whether pre-procedural review of CT anatomical and physiological findings will translate to more complete and appropriate revascularisation has yet to be proven but if so could result in a significant shift in the management of CAD. This hypothesis needs to be tested in a trial setting. SYNTAX IV will help fill the data gap but additional data are required from populations referred for invasive angiography. While it remains early in the clinical adoption of FFRCT and other advanced computational analytics in clinical practice with many outstanding clinical questions, we may be witnessing a paradigm shift in the management of coronary artery disease. It is possible that in the not-so-distant future that the majority of patients will go to the catheterisation laboratory with an interventional strategy in mind with a large majority undergoing ICA and also undergoing PCI. Beyond simply improving catheterisation laboratory efficiency, the ultimate goal is to ensure that those that undergo PCI receive the intended benefit of complete ischaemic revascularisation which the current paradigm is not offering with a high enough frequency. Williams M, Shambrook J, Nicol E. The assessment of patients with stable chest pain. Heart 2018;104:691–9. Williams MC, Moss A, Nicol E, Newby DE. Cardiac CT improves outcomes in stable coronary heart disease: results of recent clinical trials. Curr Cardiovasc Imaging Rep 2017;10:14. Foy AJ, Dhruva SS, Peterson B, et al. Coronary Computed Tomography Angiography vs Functional Stress Testing for Patients With Suspected Coronary Artery Disease: A Systematic Review and Meta-analysis. JAMA Intern Med 2017;177:1623–31. 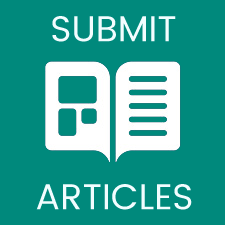 Williams MC, Hunter A, Shah ASV et al. Use of coronary computed tomographic angiography to guide management of patients with coronary disease. J Am Coll Cardiol 2016;67:1759–68. SCOT-HEART Investigators. CT coronary angiography in patients with suspected angina due to coronary heart disease (SCOT-HEART): an open-label, parallel-group, multicentre trial. The Lancet 2015;385:2383–91. Yan RT, Miller JM, Rochitte CE, et al. Predictors of inaccurate coronary arterial stenosis assessment by CT angiography. JACC Cardiovasc Imaging 2013;6:963–72. Norgaard BL, Leipsic J, Gaur S, et al. Diagnostic performance of noninvasive fractional flow reserve derived from coronary computed tomography angiography in suspected coronary artery disease: the NXT trial (Analysis of Coronary Blood Flow Using CT Angiography: Next Steps). J Am Coll Cardiol 2014;63:1145–55. Koo BK, Erglis A, Doh JH et al. Diagnosis of ischemia-causing coronary stenoses by noninvasive fractional flow reserve computed from coronary computed tomographic angiograms. Results from the prospective multicenter DISCOVER-FLOW (Diagnosis of Ischemia-Causing Stenoses Obtained Via Noninvasive Fractional Flow Reserve) study. J Am Coll Cardiol 2011;58:1989–97. Min JK, Leipsic J, Pencina MJ, et al. Diagnostic accuracy of fractional flow reserve fromanatomic CT angiography. JAMA 2012;308:1237–45. Nørgaard BL, Hjort J, Gaur S, et al. Clinical use of coronary CTA-derived FFR for decision-making in stable CAD. JACC Cardiovasc Imaging 2017;10:541–50. Nørgaard BL, Gaur S, Leipsic J, et al. Influence of Coronary Calcification on the Diagnostic Performance of CT Angiography Derived FFR in Coronary Artery Disease: A Substudy of the NXT Trial. JACC Cardiovasc Imaging 2015;8:1045–55. Møller Jensen J, Erik Bøtker H, Norling Mathiassen O, et al. Computed tomography derived fractional flow reserve testing in stable patients with typical angina pectoris: influence on downstream rate of invasive coronary angiography. Eur Heart J Cardiovasc Imaging 2017;19:405–14. Collet C, Miyazaki Y, Ryan N, et al. Fractional flow reserve derived from computed tomographic angiography in patients with multivessel CAD. J Am Coll Cardiol 2018;71:2756–69. Ihdayhid AR, White A, Ko B. Assessment of serial coronary stenoses with noninvasive computed tomography-derived fractional flow reserve and treatment planning using a novel virtual stenting application. JACC Cardiovasc Interv 10:e223–e225. Choi KH, Lee JM, Koo BK, et al. Prognostic implication of functional incomplete revascularization and residual functional SYNTAX score in patients with coronary artery disease. JACC Cardiovasc Interv 2018;11:237–45.